A while back I posted a recipe for olive salad that approximates the one that is used at the Central Grocery in New Orleans. Then I started reading Yelp reviews (which I try to avoid at all costs) and recipes on the Internet. All of that inspired me to write about what is said to be the “Original Muffuletta” and the Central Grocery. First, there are Yelp complaints that the Central Grocery is dirty. C’m’on folks, the store is on Decatur Street in the Vieux Carre (the French Quarter). It is as old and as down at the heels as all of the other buildings in the neighborhood. At least one history says that the store was founded in 1906. It has probably operated non-stop ever since, except during severe hurricanes. Besides, a visit gives you the opportunity to wander the aisles and see some amazing food choices, like Bombay duck – not a duck at all, but rather a long dried fish with fearsome eyes and teeth – sticking out of a barrel, and Italian delicacies hard to find elsewhere. Then, some yelpers complain about rudeness of the men who make the sandwiches. I guess those reviewers have never been to Katz’s or Russ and Daughters on East Houston in Lower Manhattan. It is true that you need to be ready to order when you get to the front of the line, but the men are as friendly as I would be if I made sandwiches all day long. Some recipes on the Internet call for lettuce or tomato. That doesn’t work, because then the sandwich becomes a sub or a hero. Some say that there are better versions elsewhere. I don’t know about that, but remember that the original is the original. The only place I know of that has a comparable sandwich is Fertitta’s in a seedy part of Shreveport, LA. Fertitta’s calls its sandwich “the Muffy”, and they make claims to being the original. Whichever, the tale about the Central Grocery is that around 1906, Italian workers started coming to the grocery with lunches of cheese and meat. The owner of the Central grocery suggested putting the lunches in loaves of muffuletta, a Sicilian bread, and the muffulletta sandwich was born. Probably apocryphal, but it makes a good story. These days the sandwich is sold as a whole or a half, and the whole is cut into fourths before being wrapped in butcher paper. That’s really enough for four people, but many customers eat the whole thing. The paper gets olive oil stains all over, and that’s when you know the sandwich is ready to eat. Boxes and barrels are used as seats and scattered around the crowded store, but you probably want to take a brief walk to Jackson Square and enjoy your lunch al fresco on a sunny day. Bread. To me, the bread is an essential part of the successful muffuletta. The loaves at the Central Grocery are delicious, and in my experience only available in Louisiana, especially New Orleans. Schlotzky’s makes a reasonable substitute. Recently I discovered that the 9 inch focacchia loaf from Panera Bread makes another suitable choice. Meat. You can choose whatever you like. Mortadella – a good mortadella and not plain “baloney” – is almost a requirement as is salami (I used Genoa). Ham is also important. A good Italian coppacola is my favorite, but any thinly sliced delicatessen-style ham can be used. Cheese. Provolone and/or mozzarella are classic choices. Add generous layers of meat and cheese and top with the top half of the bread loaf. Cut in four quarters. One quarter should serve most adults. Recently we were visiting in San Francisco around the time of the birth of Sarah and Evan’s second child. By the way, it’s a boy! During our visit we, of course, paid a visit to Rich Table and had a great meal. But the night that Mommy and the new brother came home from the hospital, we wanted to make it a special family evening, so Susan and I went to Bar Tartine in the Mission district. The restaurant is part of the Tartine group operated by Elisabeth Prueitt and Chad Robertson of Tartine Bakery fame. The co-chefs at Bar Tartine are Nick Balla and Cortney Burns, who are friends with Sarah and Evan. To help us celebrate the new baby, they really pulled out the stops to make it a memorable evening for us as well as for our family. They certainly did that! The bread on the table was freshly baked famous Tartine Country Loaf baked by Chad Robertson himself. The bread is one of the best in San Francisco. I say one of the best because Sarah makes a killer loaf of Douglas-fir scented levain for Rich Table. Of course, we followed Sarah and Evan’s recommendations for what to order, though to tell the truth, I don’t think you can miss on ordering anything on the menu. 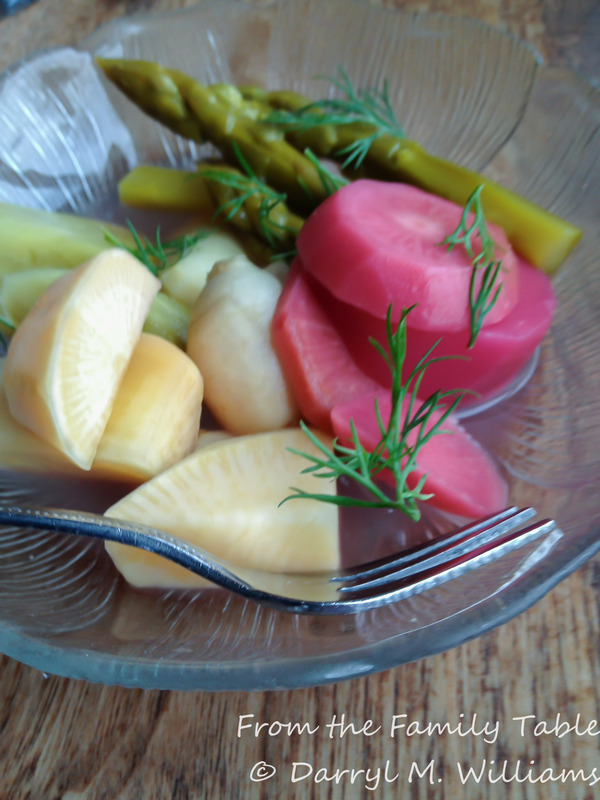 The brine-pickled vegetables are deceptively simple. A colorful plate of root vegetables comes to the table and you find immediately that the fresh tastes and crunch of each has been preserved even with a tangy, lightly pickled overtone. 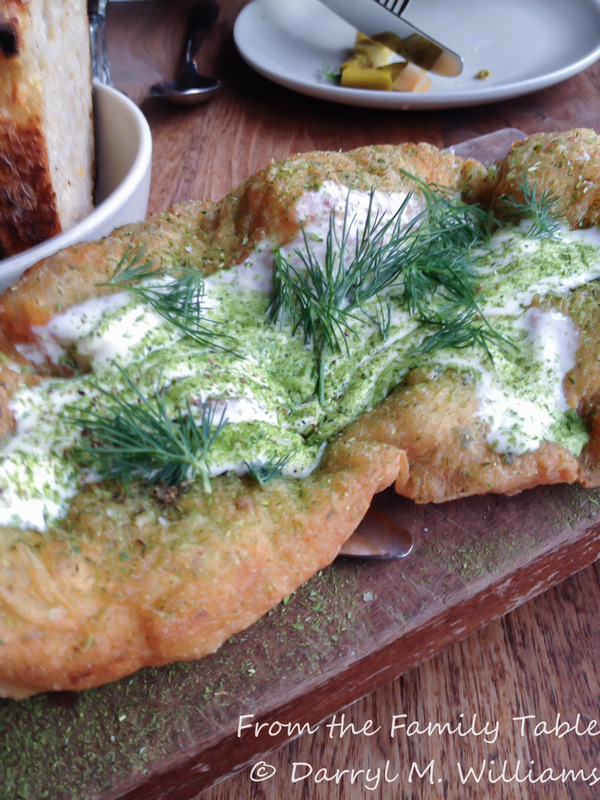 The potato flatbread with garlic and sour cream is a must. 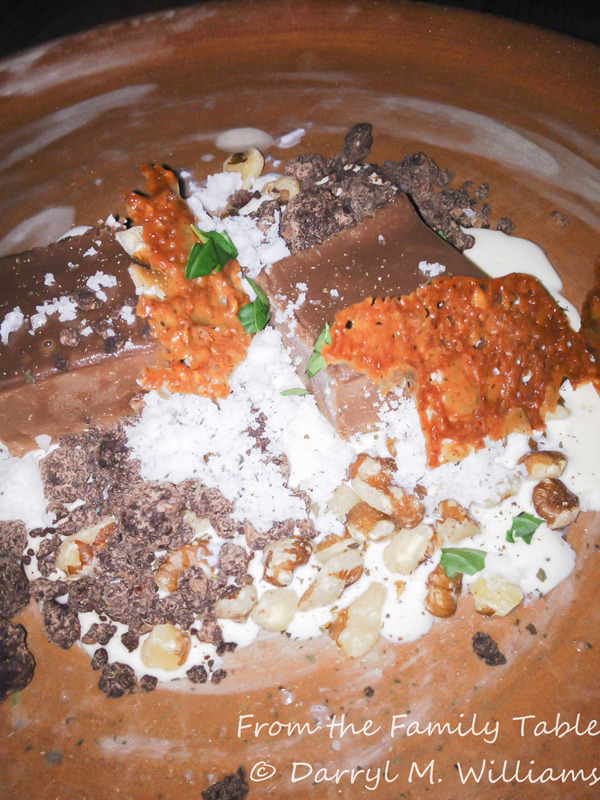 The beautiful presentation makes it almost too pretty to eat – almost, because when you take a bite, the flavors come together and literally seduce you to finish the whole thing. The smoked potatoes with black garlic are very unusual. If you don’t like smoked foods, then don’t order them, because they are definitely rich with fresh wood smoke. The black garlic adds its own overtones. 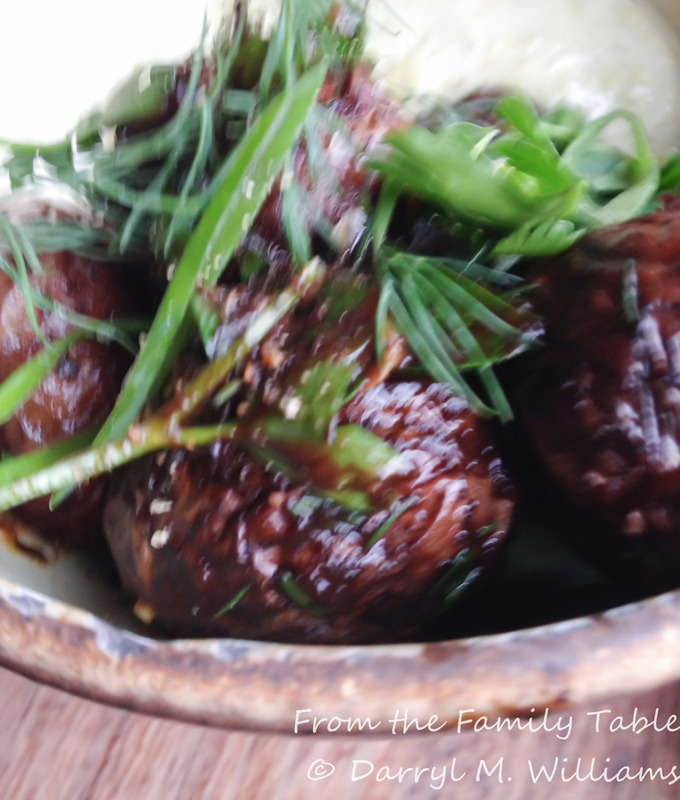 It is very popular in restaurants in the Bay Area as well as the whole country. It has been used in Asia for centuries as a food and as a health supplement, but it was commercialized in the US by Scott Kim. He says the garlic is fermented in conditions of controlled heat and temperature while others say it is not fermented but rather deeply caramelized by the Maillard reaction over several weeks. Whatever the process, the result is garlic that turns inky black, given up its pungency, and gained a rich flavor that has been said to have elements of molasses, chocolate, and umami. Kim now provides the black garlic from his operation in Hayward, CA. (Just down the road from Gilroy, the self-proclaimed “Garlic Capitol of the World”. ) You can learn more about the product or even order your own from Blackgarlic. I can’t imagine someone not liking the very earthy flavor of this creative dish. The whole new potatoes are beautifully garnished, tender and very tasty. Unfortunately my shaky image doesn’t do them justice. The beet and blue cheese salad comes beautifully presented. Now, I am not a big fan of beets in any form, but this salad makes even me a believer. 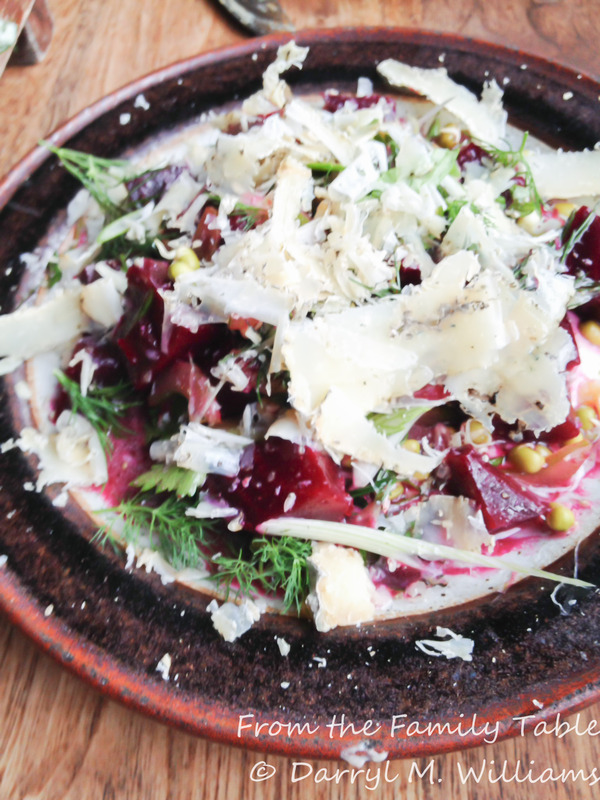 The beets are sweet as they always are, but that plays off the blue cheese so well. The beef tartare on koji (an Asian “yeast” – a form of Aspergillus used to ferment various foods including miso, soy sauce, and sake) toast with bottarga (salt-cured fish roe) is beautiful. Fortunately we had a very informed server who filled us in on all of the ingredients. 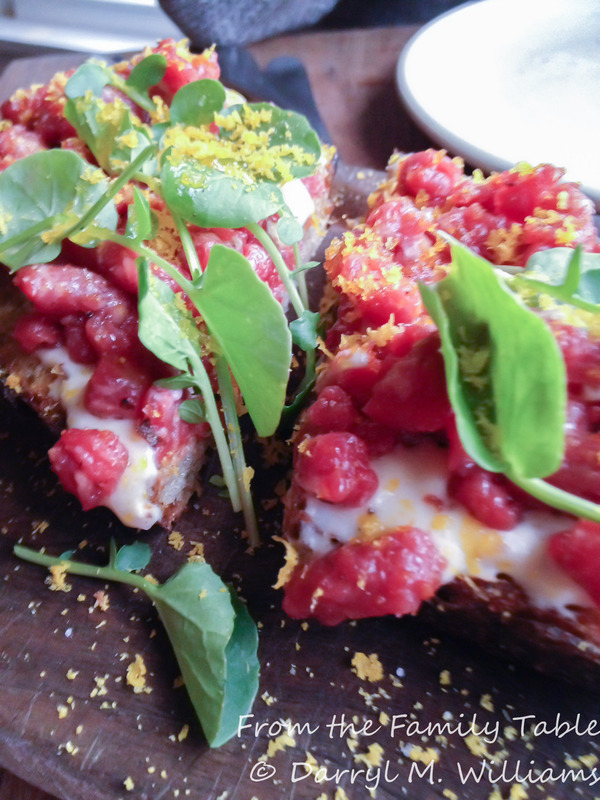 This is unlike any other beef tartare you have ever eaten. 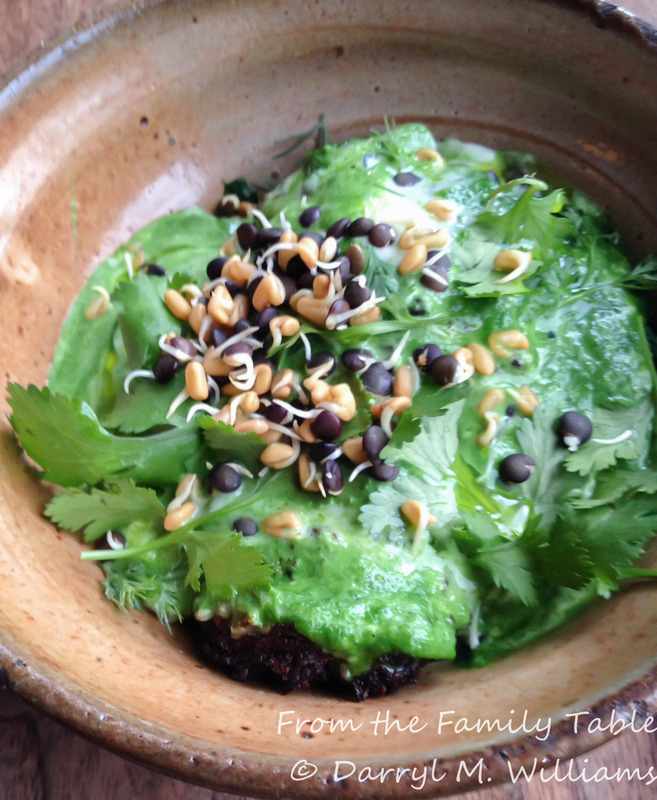 I’ve eaten lentils lots of different ways, usually in a dal or soup, but never sprouted, so the visual impact of the sprouted lentil croquettes with kefir and coriander is spectacular, and the taste is unlike any of those other lentils that I have eaten. 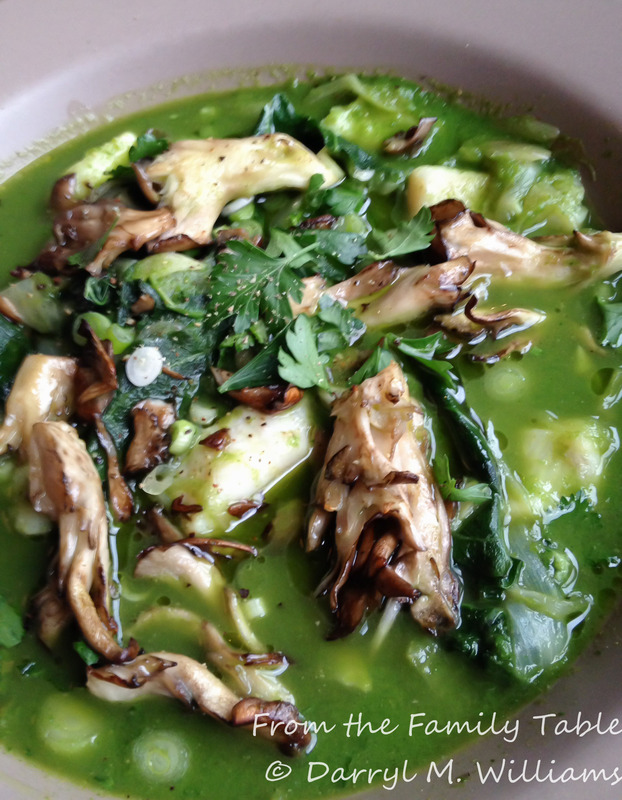 My green chili fisherman’s stew with collard was very spicy – much too spicy for Susan – but it came as an emerald-green broth filled with seafood and hen-of-the-woods mushrooms. And collard!! When one is used to the limp, damp clot that’s called collard greens in a Southern cafeteria line, you are unprepared for the lovely, delicious variation presented in this dish. 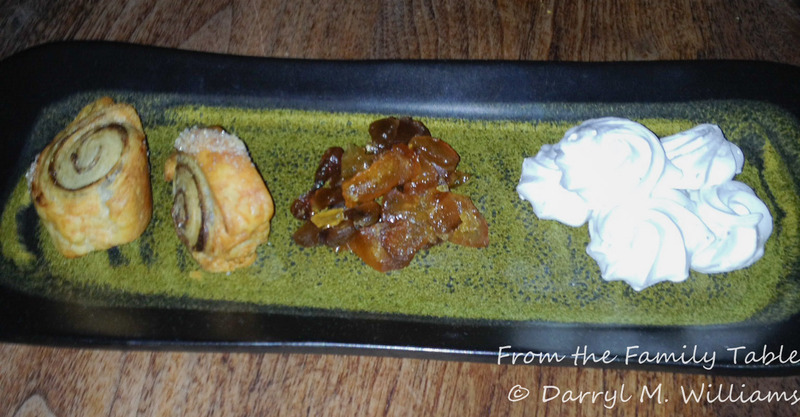 Hard as it is to believe, we had room for a little dessert “amuse” of meringues, rugalach, and candied fruit along with a complex carob mousse with goat cheese and black walnuts. After such an incredible feast we went back to our beds. In the meantime, the new family had their own very special celebration, and two new brothers got acquainted. For some strange reason, I developed a craving from my childhood – a pimento (an alteration of the Spanish word for pepper, pimiento) cheese sandwich. Interestingly enough, since then I have become aware that pimento cheese is popping up on more and more restaurant menus. The delicacy is borne of the Great Depression. It made a good substitute for PB&J and was cheap. Besides that, it came in little glasses stenciled with colorful embossed designs so that over time you could accumulate a whole set of juice glasses. In the South, pimento cheese sandwiches were the stuff of ladies luncheons. I have also heard that they are a tradition at the Masters Golf Tournament in Augusta, Georgia, but obviously less iconic than the green jacket. For my lunch bag, the cheese was spread between two slices of white sandwich bread. For the fancy version, the crusts are removed and then the sandwiches are cut into fancy shapes and often garnished with watercress. Except in the South, all of that is of the 40s and 50s. The little glasses are still available, but they have lost their colorful embossing. In my local grocery store, one 5 ounce glass was priced at nearly five dollars. In the South, and probably other places, you can still buy pint containers from the chilled dairy section at the super market. All of that is mostly of historical interest. It is easy to make your own, and it is guaranteed to be tastier. On top of that, you can doctor it up any way you please. The basic recipe calls for three ingredients: Cheddar cheese, bottled pimentos, and mayonnaise. I’ve added chopped “snacker” peppers for crunch. These cute little peppers have only recently been showing up in my local market. I’ve also added sour cream and Spanish hot paprika. Once you have your pimento cheese spread, you can keep it in the refrigerator for a while. As well, if you get tired of sandwiches, you can use the spread for stuffed celery – another 1950s classic – or whatever you can dream up including twice baked pimento cheese potatoes. You’ll have to find your juice glasses elsewhere. Pierce the potato in several places with a sharp fork. Coat with the butter, and bake in the middle of an oven preheated to 350° F for 75 minutes. When the potato is baked, remove from the oven and cool on a baking rack. Cut the potato in half lengthwise and scoop out the potato flesh, leaving a ¼ inch shell and being careful not to break the skin of the potato. In a small bowl, mash the potato flesh until smooth. Add an equal amount of pimento cheese spread and mix to combine. Stir in the scallions and bacon. Divide the mixture in half and pack into the potato shells. Return the stuffed potatoes to the middle of the oven at 400°F for 15 minutes. Then turn on the broiler and continue to broil the potatoes until the tops are well browned – about another 2 minutes or so. Serve immediately while still warm. Serves two. It is hard to say enough good things about the b. Patisserie. This French-style bakery has been open only a short time , but it has already collected a lot of awards and a big following. It is located in Pacific Heights/Laurel Heights at 2821 California Street. The chef/owner, Belinda Leong, a friend of Sarah and Evan, is an experienced pastry chef with many awards. She is formerly the pastry chef at the Michelin-starred Manresa in Los Gatos, CA and has also spent time in the fabled Parisian patisserie, Pierre Hermé. The main attraction of b.’s is, of course, sweet pastry in the French style, but there is also a wide selection of granolas, mousses, quiches, and tartines so you can enjoy a nice lunch or snack with dessert. There ae pln†y of tables inside as well as some comfortable chairs outside. If you prefer, you can have it all packed in a box to take home, but then you have to forego the very interesting people watching. There is a wide selection of croissants from plain (Is there such a thing as a “plain” croissant?) to a completely decadent chocolate, banana-almond version that is filled with a velvety banana cream. The kouign amann is a wonder. Made of a light dough (I think it is puff pastry) and shaped like an opening flower bud, the outside is a caramelized brown, crisp and glistening with sugar crystals, reminiscent of a palmier. Break open the petals and the inside is filled with a nectar from the transformed sugar inside. You will need extra napkins even if you eat it with a fork. The passion fruit-flavored bostock is redolent of almonds and the wonderful scent of passion fruit. The creamy little cake is so elegant and so flavorful. When we visited, it was lunch time, so I ordered a muffuletta tartine. If you have been to New Orleans, you probably have had a muffuletta from the Central Grocery in the French Quarter where it is said the sandwich was invented more than a hundred years ago. The original is served on a giant Italian bread roll with provolone, salami and cappicola. The thing that really makes it a muffuletta and different from other subs, heroes, and po’boys, though, is the unique “olive salad” rich with garlic, olive oil, chopped olives, and pickled vegetables. Belinda’s muffuletta nails the flavors of the original, including the olive salad. But it is so much more: served on a thin slice of flavorful toasted French bread slathered with olive salad, covered with Black Forest ham, Genovese salami, and mortadella topped with provolone melted under the salamander. Only one word: delicious. 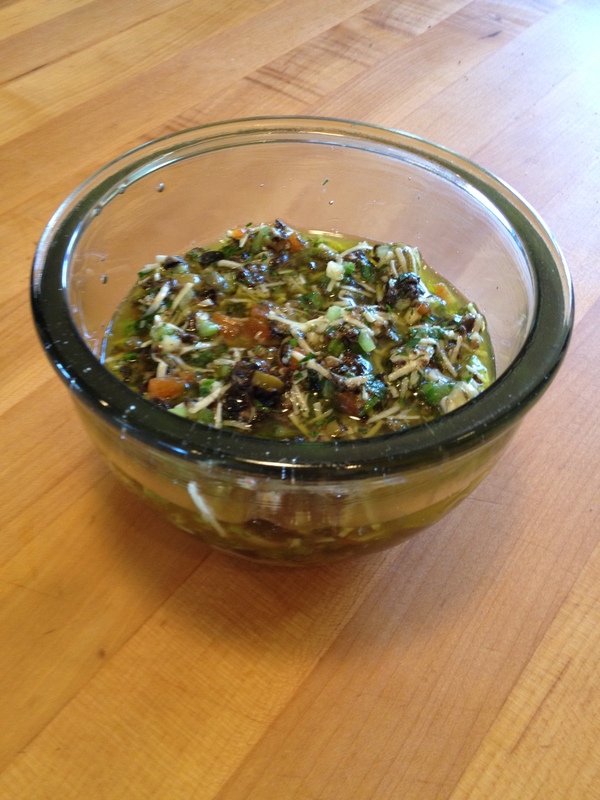 To help you make your own muffuletta, either like the original or as a tartine, I am providing you with one of our family secrets, a recipe for olive salad that we collected when we lived in Louisiana and have subsequently included in our family cookbook. Let stand over night at room temperature. Use a generous serving when making a muffuletta. Scrapple is a great family favorite that comes from my wife’s heritage. Although she grew up in Texas, she was born in Wilmington, Delaware where many of her family still reside. Wilmington is on the edge of the scrapple epicenter which lies in the Pennsylvania Dutch communities of southeastern Pennsylvania and extend into nearby New Jersey and Delaware. The Oxford Companion to American Food and Drink (Oxford University Press, 2007, page 529) has a comprehensive treatise on scrapple. The dish is the descendant of European pork puddings. What makes it American is the use of cornmeal, but grits and buckwheat may also be used. The Pennsylvania Dutch called it pawnhas before it was called scrapple, and the origin of the word “scrapple” remains cloaked in mystery and controversy. For a long time it was a regional specialty, but more recently it has been distributed throughout the country. There is also some discussion about ingredients. Traditional recipes call for pork neck bones cooked until the meat is ready to fall off, or pig knuckles, and other pig parts. I discourage you from reading the ingredient list on packages of commercial scrapple; it is reminiscent of the ingredient list for Mexican chorizo. If you can’t find commercial scrapple, it is easy to make a close semblance of the real thing in your own kitchen. If you have a favorite sausage recipe, you can make the scrapple even better by using your home-made sausage. After you have eaten your fill of freshly made scrapple, you can freeze any extra and use it whenever you have a craving for fried eggs and scrapple with ketchup. A technical note: I used two large (9×5 inch) bread pans but medium (8½x4½ inch) would also work. In a large pot, bring the water to a boil. Break up the sausage into chunks and drop into the boiling water. Return to the boil, and with a wooden spoon break up the sausage into fine lumps as it cooks. Fat will float to the top, but don’t worry. It will get incorporated into the mixture and help it to hold together when it cools and when it is fried. When the sausage is cooked and well-dispersed, whisk in the cornmeal very slowly . With a wire whisk, whisk vigorously to prevent lumps from forming. Reduce heat to the simmer and cook, stirring occasionally, for 30 minutes or until the mixture has thickened and the cornmeal is well cooked. Add salt, sage and optional red pepper flakes. Adjust seasoning and remove from the heat. Completely cool the scrapple-filled bread pans. Cover with plastic wrap, and chill overnight in the refrigerator. The next day, run a knife around the edge of the chilled loaves of scrapple to remove from the pan. Cut into blocks to be wrapped in plastic film and aluminum foil for freezing. Use fresh, or thaw the appropriate amount when you are ready to use. Cut into ½ inch slices. Fry in melted butter until browned on both sides. Serve while still hot with fried eggs and ketchup.